Cold weather = dry skin for me. As soon as the temperature drops, I like to up my skincare game. I have eczema and sensitive skin so trying new products is dangerous territory. I’ve lost count of how many times I’ve broken out in spots or had a reaction to an item so when I find a product that doesn’t, I bulk buy it! 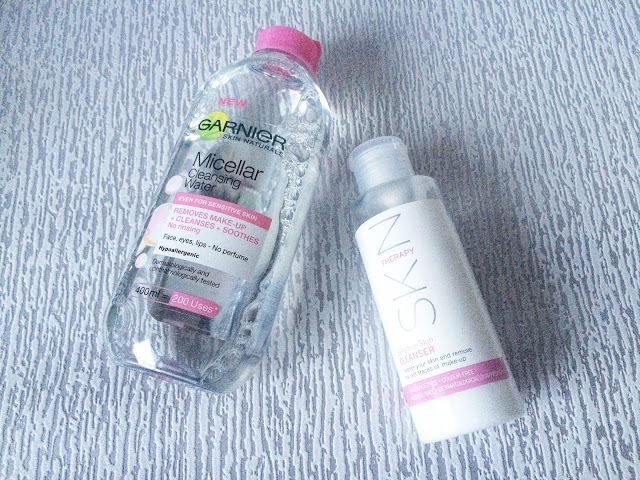 Garnier Micellar Cleansing Water: This is the easiest product to use. Even if I don’t do my full skincare routine, just a swipe of this and moisturiser at least gives my skin a light cleanse! I’ve now started to buy this in the 700ml bottle because I use it so much! Wilko Skin Therapy Sensitive Cleanser: For 95p, I can’t believe how good this is. It’s a cream cleanser which works well for dry and sensitive skin and it doesn’t require rinsing with water after use either! MonuPlus Brightening Boost Serum: I actually won this as part of a giveaway prize from Jordan a few months back and have been using it once a week. I’ve found that I can’t use it when my skin is in bad shape so I use this only when my skin is clear and spot-free! 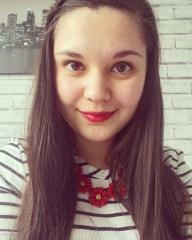 Superdrug Simply Pure Hydrating Serum: I bought this on a whim a few weeks ago and have been using it every day since. 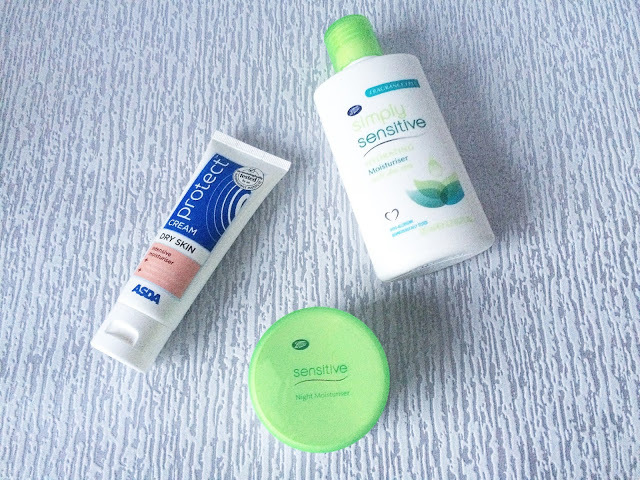 It’s perfect for sensitive skin like mine and doesn’t break the bank at only £2.69. I use a very small amount every night so it can soak into my skin. Wilko Skin Therapy Sensitive Toner: Again, at 95p, I wasn’t expecting much. I’ve found that this can be quite drying on skin so I make sure to double moisturise afterwards. It’s fairly light compared to other toners I’ve previously used! Asda Protect Dry Skin Intensive Moisturiser: I’m pretty sure this is now a discontinued product but it’s okay because I have about 30 tubes of it! I found that buying eczema cream on prescription was far too expensive and wanted an alternative. This used to cost about £1 a tube until one week we found it had gone down to 17p so my dad bought me every tube they had left! I use this as a base moisturiser before applying either of these two. Boots Simply Senstive Night Moisturiser: This takes forever to sink into the skin which is why I apply this right before going to sleep! I found I didn’t like the way it felt on my skin alone hence why I use a basic cream first before applying this. Boots Simply Sensitive Hydrating Day Moisturiser: This is super lightweight and quick-drying which is perfect for mornings as I’m always pushed for time! The bottle requires shaking every time though or what you squeeze out just looks like water! 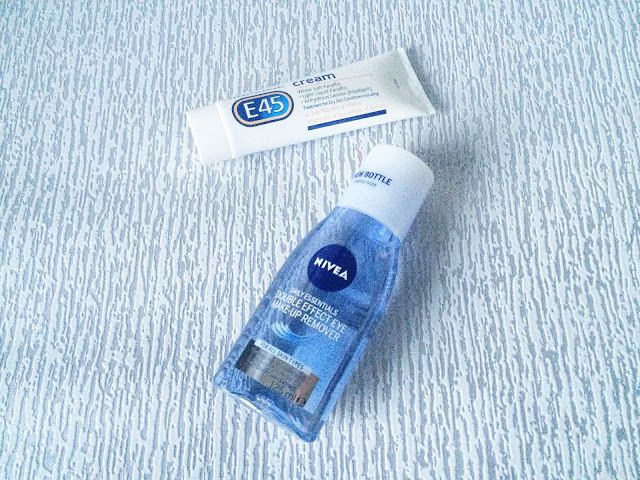 E45 Dermatological Cream: This has been a household favourite for as long as I can remember! I don’t use this on a daily basis but I always use it for spots or rashes that I get on my face or anywhere on my body in all honesty! There’s nothing this cream can’t do! Nivea Double Effect Eye Make-Up Remover: The holy grail of eye make-up removers. I only use this when I have lots of make-up on as I find micellar water is good enough most of the time! 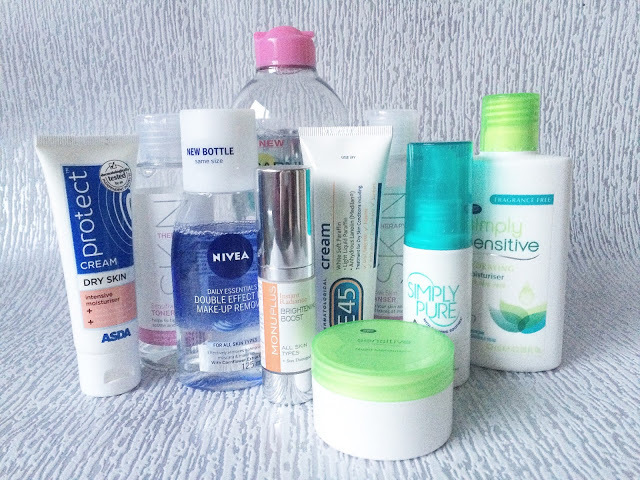 Do you have any favourite skincare products? Do you change up your routine in winter? Leave me a comment below!